If I am not mistaken, a theoretical point-source, infinite line-source and infinite plane source are all capable of perfectly reproducing an impulse. I always thought that the 'impulse train' you see when you measure a real-world line-array is caused by practical limitations in driver size and spacing. However, now I'm not so sure. According to the Huygens principle any point on a wave-front can be represented by imagining that on every point on the wave-front there is a point-source that emits a spherical wavefront. The complex sum of this infinite number of point-sources describes how the initial wave propagates. This means that a line-source and a plane-source can be modeled as an infinite number of point-sources. I think I understand how this works with continuous signals such as a sine-wave. But what happens when we send an impulse to for instance a line-source? If the wave-front truly is cylindrical in shape, I imagine the impulse-response would be perfectly reproduced. But if the wave-front is the result of an infinite number of point-sources as per Huygens, I would expect to see a first relatively strong impulse followed by an infinite number of ever smaller impulses. Is this really what happens in the case of the theoretical ideal line source and plane source? Last edited by keyser; 20th November 2015 at 09:57 AM. It may be useful to view the impulse as an infinite band of independent sinewaves. There may indeed be some spatial behaviour that is displayed at one end of the band that differs from the other end. I would expect to see a first relatively strong impulse followed by an infinite number of ever smaller impulses. Is this really what happens in the case of the theoretical ideal line source and plane source? would just show directivity, though. Last edited by rayma; 11th November 2015 at 11:31 PM. Could you give an example of what a good impulse would look like? By the way, that flying line at the top is the STEP response. Wiggles are probably comb filtering, as that is very real. Distance between speakers for this array: 85.5 mm, 25 drivers. Time difference between out most driver arrival at ear vs the driver at ear height 0.6 ms.
21.6 cm time difference to ear at 3 meter distance. if the wave-front is the result of an infinite number of point-sources as per Huygens, I would expect to see a first relatively strong impulse followed by an infinite number of ever smaller impulses. Is this really what happens in the case of the theoretical ideal line source and plane source? Your expectation isn't far from the truth. Considering a line array of infinite length made up of an infinite number of point sources, with each point source producing a flat frequency response, the impulse response at the listening position will consist of a step up followed by a decay that asymptotically approaches 0 but never quite reaches it. However, despite the flat frequency response of the point sources, the frequency response of the array at the listening position will have a low-pass response with a slope of -3dB per octave. Equalization back to a flat frequency response will change the impulse response, and you will no longer have the step-decay scenario I described earlier. What you end up with will depend on your method of equalization, I suppose. I haven't looked too deeply into that, but it looks like Wesayso has achieved nice results. Last edited by bbutterfield; 12th November 2015 at 03:10 AM. I'm not sure I understand. A point source has no directivity. Right, a line or plane source would show directivity, not a point source. I wanted to come back to this point, because I still see a lot of posts associating a "time smear" with line arrays. Here's a picture that roughly represents the impulse response I was describing for an array of elements each with a flat frequency response (and minimal or no phase distortion). The closest speaker impulse arrives first, and is the loudest. Subsequent arrivals are delayed and attenuated. As mentioned, this results in a low-pass effect at the listening position when the response to all the elements is taken together. In order to correct for that, the response needs to be shaped. A high pass filter needs to be applied to counteract the low pass effect of the line array element combination. Ignore the stuff above 20 khz. 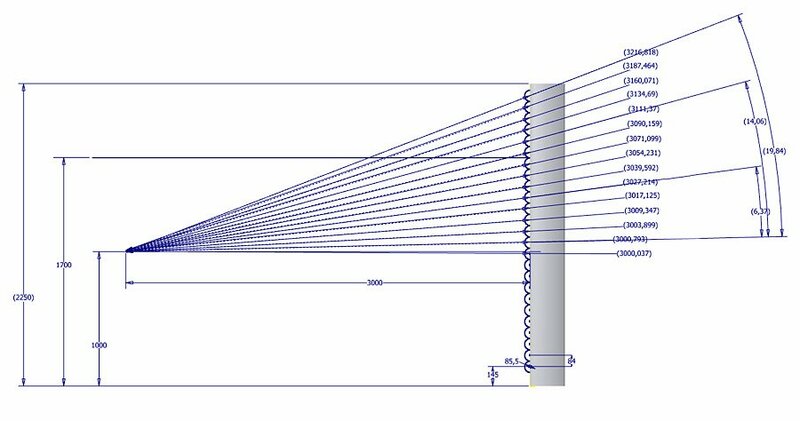 Now let's re-imagine our line array impulse response when each element is high-pass filtered to offset the low-pass system response. If each element is producing an impulse response like that shown above, then the positive spike of each subsequent arrival is offset by the negative spike of the prior arrival. 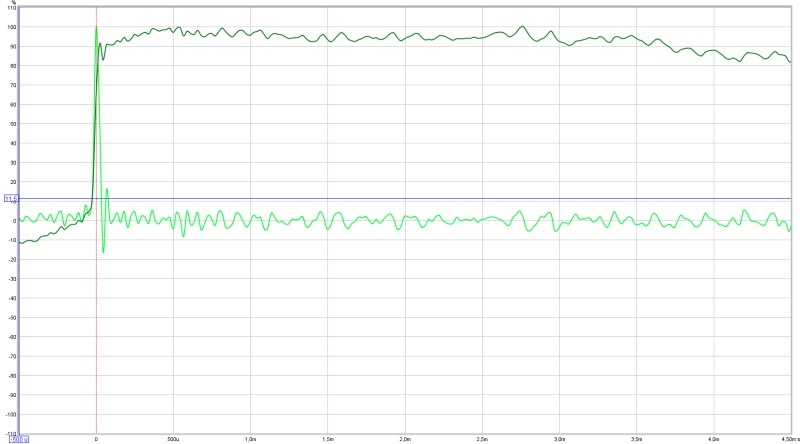 This can give the effect of a nice clean impulse on the listening axis, with no "time smear". Sorry I don't have the time to post simulations at this time... I have other things going on. Thanks bbutterfield. So basically what you are saying, is that a line-array is still a minimum-phase system and its smeared impulse response can be fixed simply by means of a minimum-phase filter. This filter fixes both the transfer function, as well as the impulse. Very interesting! I think it makes sense. If you can find the time, I'd still love to see it. What software do you use to run those sims?